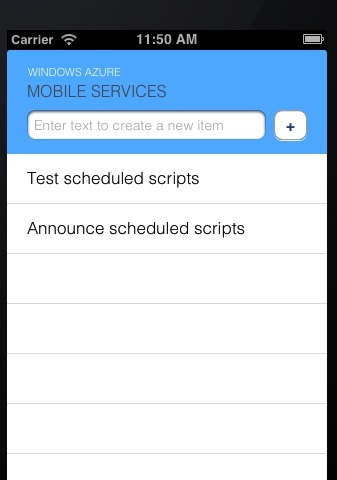 Today I’m happy to announce the availability of scheduled scripts inside of Windows Azure Mobile Services. Scheduled scripts, also known as CRON jobs, allow you to define a server side script (just like you can for table CRUD operations) that you can then make run on a schedule or on demand if you want. This opens up a wide array of scenarios to do background processing, on the fly push notifications to users, and many other things. Today I’m going to walk you through creating a very simple script which will compliment the quick start application that is available with Mobile Services. I’ll walk through creating a new service quickly but if you want, you can skip that step and go down to the Scheduler part beneath it. Now we’ll look at scheduling a script. As you can see, the script added my todo and it’s appearing without any issues. If for some reason it didn’t show up, we could return to the portal and go to the Mobile Service’s Logging tab to see if our script recorded any errors. There is one important limitations to scheduled jobs and that is the number that you can have. 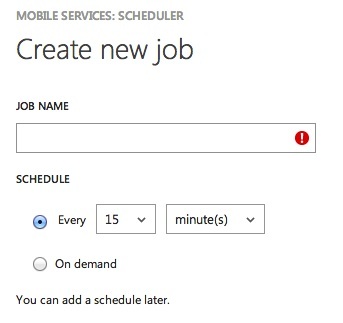 When you’re running in the free preview for Mobile Services, you are limited to one scheduled job per mobile service (not per subscription). You can increase this limit by moving up to a paid reserved instance if you want. 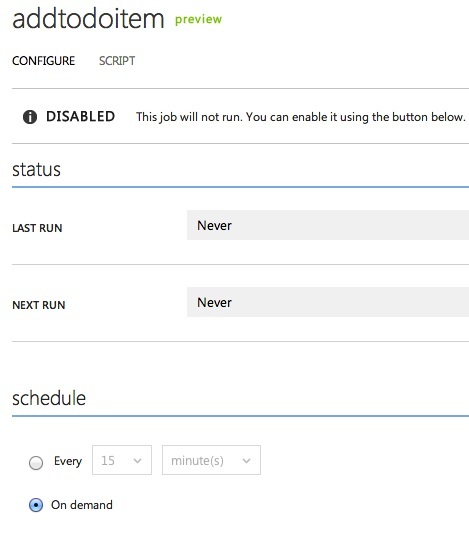 If you do try to create another scheduled job, you’ll see a notification appear at the bottom of the portal which says Cannot create scheduler job. The maximum number of scheduler jobs in free mode is 1. To create more jobs, please use the Scale tab to switch your service to reserved mode. 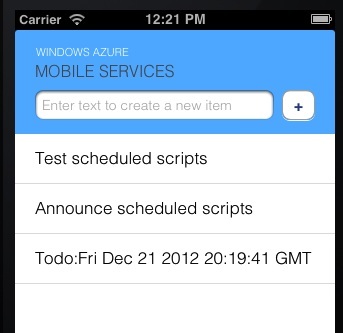 Today we released Scheduled scripts for Windows Azure Mobile Services. This allows you to run both on the fly and scheduled scripts. Today we just inserted another item into our table but there are tons of things you can do inside of these jobs. If you wanted to trigger an on the fly push notification, you could do it here. 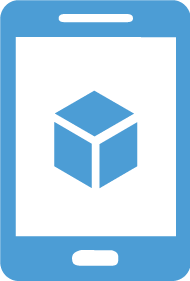 If you wanted to send a daily email (using the Send Grid module) you could set it up as a job here. These are just a couple things you might want to do. 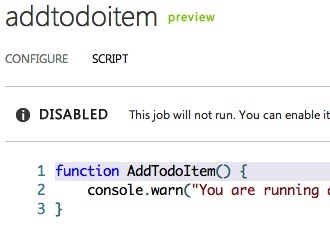 Additionally, as the capabilities of the server side scripts grow, you’ll be able to make use of new capabilities from both the CRUD scripts and your scheduled job scripts. There is more information available on Scheduled Scripts at Scott Gu’s blog here. 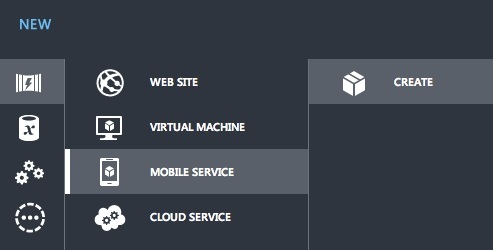 You can sign up for a free Windows Azure trial and get access to Mobile Services here.